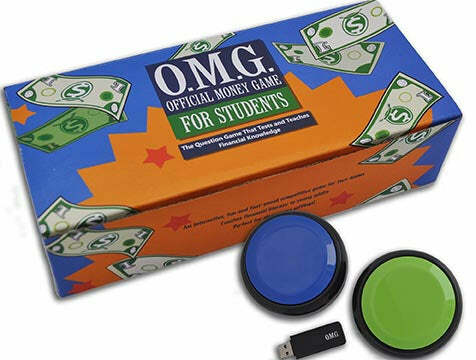 The Official Money Game for Students is a fun, fast and interactive team-based competitive game for two teams that operates somewhat like Family Feud and involves the entire class. The game teaches financial literacy to young adults and is perfect for educational settings. Team members take turns trying to correctly answer a series of multiple choice questions about personal finance subjects such as budgeting, saving, credit and credit cards, basic banking and identity theft. Even when students get the answers wrong, the whole class will gain a wide variety of personal finance knowledge. Appropriate for students in middle school and high school. Game kit includes the following components: USB Flash Drive with game in PowerPoint format; printable instructions and score card in PDF format; two answer buzzers (each buzzer requires 2 AAA batteries which are not included). Technical requirements: Mac or Windows computer with a USB port; Microsoft PowerPoint installed on the computer; ability to project the presentation onto a large screen or smart board.